Imagine a scene in which Ben Kingsley and Michael Caine sit across from each other engaged in a game of chess. A game preceded by a story involving their doctor characters’ ragingly disparate views regarding the care of asylum inmates. How could that be boring and feel so phony? Well, Stonehearst Asylum accomplishes that dubious feat. Director Brad Anderson, who effectively mined an asylum setting for the very different Session 9, gets lost in the weeds a bit while attempting to balance a twisty chiller with Victorian insanity. The craziness is literally put on display from the opening moments. At Oxford University in 1899 a doctor played by Brendan Gleeson uses Eliza Graves (Kate Beckinsale) as a prop to lecture on hysteria. As he explains, even though she’s a “comely” woman and privilege to “good breeding” she’s diseased. Probably appearing as such in part due to the heroin she was given as a sedative. The opening suggests horrific treatments conducted on the mentally ill at the turn of the 20th century, but the film quickly turns into a cursory approximation of a classic Hammer horror aesthetic. 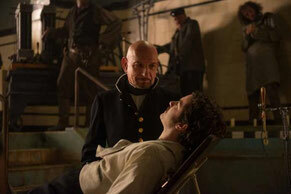 Cut to Christmas Eve when wide-eyed young doctor Edward Newgate (Jim Sturgess) arrives at Stonehearst Asylum hoping to shadow its director, Dr. Lamb (Kingsley). The strange doctor allows the inmates to roam throughout Stonehearst to create a sense of strange community. We learn that Lamb’s predecessor, Dr. Salt (Caine), believes in very different methods. Where Salt is and how Lamb succeeded him is a first act minor spoiler that should be fairly obvious early on, especially when considering Lamb’s associates include a twitchy assistant, played by David Thewlis, and a head nurse with a pronounced thousand-yard-stare. Eliza is a patient and Edward takes an immediate shine to her. Unfortunately, the zaniness never reaches the promise of the character names; as in, hopefully Eliza Graves can escape her grave situation with the help of Newgate. Not to mention doctors named Lamb and Salt. Newgate learns of what’s going on under Lamb’s rule, and hatches a plan to save himself and Eliza, among others. Based on a short story by Edgar Allen Poe, the screenplay from Joe Gangemi is heavy on telegraphed twists and turns and light on inspired absurdity. Anderson forces the issues with gusto, but developments feel mechanical. One great set piece involves the New Year’s Eve countdown ushering in the year 1900. As a variety of wackos smile and dance around a bonfire on the asylum grounds, there’s no thought about ushering in a brave new century that hopefully comes with sweeping reform of mental health care. It’s just used as a setting for hackneyed plans to be set in motion and to get us to a third act climax involving shock therapy and character reveals. What’s brought to light isn’t fun – or inventive, or disturbing – enough to make up for a sluggish pace and uneven performances from a talented cast. It’s not that the performances are bad; it’s that different members of the ensemble feel like they belong in different movies. Even with a master like Poe as inspiration, Stonehearst Asylum never finds the right mix of creepy and crazy.